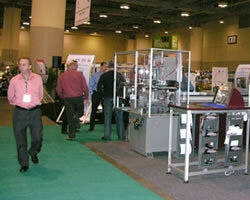 Win-door North America, held last week in Toronto, continued to attract exhibitors who wanted to take the opportunity to showcase their latest products. Though the show floor was a bit smaller than last year, organizers says the number of exhibitors was almost identical to last year, though many of those companies chose smaller exhibit spaces. There was plenty to see at Win-door as show organizers added a number of new additions to the show, including hurricane impact testing that took place right on the show floor. The IG Alley, where exhibitors who offered insulating glass products could showcase their wares, also was new. One exhibitor in the alley was Edgetech IG, which hadn't exhibited at Win-door in several years. Larry Johnson, Edgetech executive vice president, says this year was a great time to come back to Win-door as the company is celebrating the 20th anniversary in business on December 1. "Canada is a large market for us; [Super Spacer]started in Canada, so it's nice to bring the 20-year back home," says Johnson. Johnson also talked about the Department of Energy's move toward R5. The company displayed a triple unit in its booth and talked to attendees about how their product can help manufacturers achieve these requirements. Other products on display at Win-door included a variety of new glass designs from Novatech. The company designed these products keeping Canada's new ENERGY STAR requirements in mind. As of June 1, 2020, Canada's ENERGY STAR program will impose more demanding requirements for each zone. Novatech's new decorative products will offer low-E glass and argon gas to meet these new requirements. The new designs include stained glass options (Gloria) and contemporary floral designs (Bora-Bora), as well as new silk screens. ODL also introduced a new decorative product. Its new wrought iron design, the Veranda External Grille, can be opened, making cleaning easy for the homeowner. One booth that was packed during the show was that of the Royal Group. The company had a wide variety of products on display, including its Hybrid product that the company says is a complete R5 window system that combines sustainability, high performance, condensation resistance, water resistance and recyclability, all in one product. The company also displayed a quad-glazed casement for northern climates, which also offers sound abatement properties. AquaSurTech OEM introduced a new technology that will give manufacturers the opportunity to offer a woodgrain look on vinyl profiles. NuGrain™ is a paint-based application that offers a "non-repeating" pattern just like real wood. It can be used in both interior and exterior applications. The product also offers a textured feel with raised grain that creates a 3D look. There is a minimal set up and start-up waste, making small runs cost effective, according to the company. In fact, the company's Michael Braeuel reports that it has sold three machines in two months. ULTRAFAB displayed its Tri-Fin, an ultimate pile weatherseal to be used for minimizing air and water infiltration. Tests indicate a 25 percent improvement in air infiltration compared to a single fin, according to the company, and adds that customers are reporting less water leakage.